I wanted to make a dress to wear out to dinner on Saturday night. 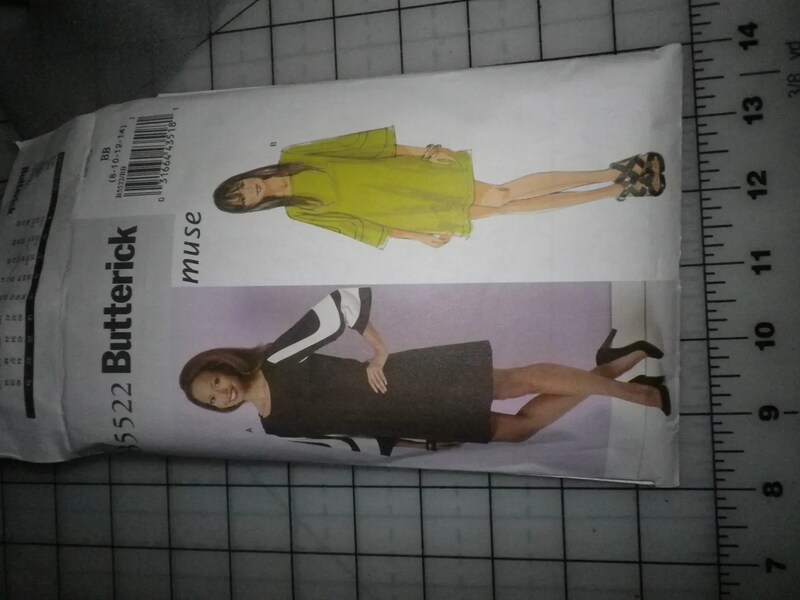 I settled on the Trina Turk designer copycat dress, Butterick 5522. 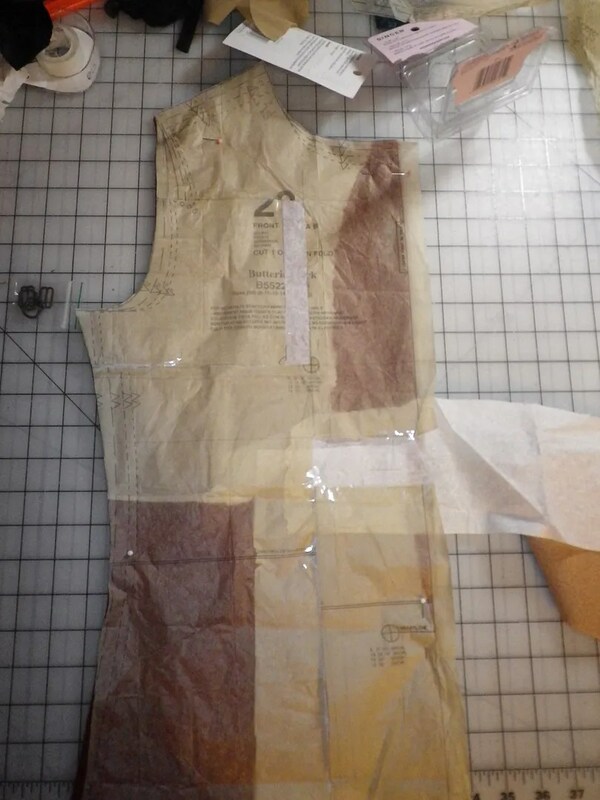 My sewing time is narrow these days so I thought I would show how I got (will get) this dress done. I admit the pattern is marked ‘easy’, and it truly is. I read on PatternReview.com that the dress is tentlike. So be it. Sacky dresses work on my figure. But, I still wanted to make an FBA. So, on the first night I made a dartless FBA increasing the width by 1 inch (I’m sewing a 14) and the length by two inches. Easy peasy. 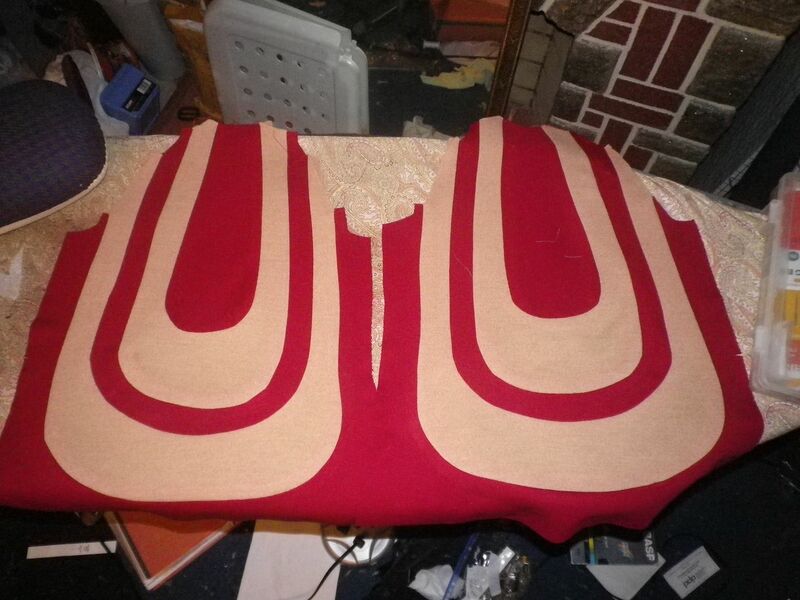 I’m using a red poly double knit coupled with a camel wool jersey for the contrast. The even numbers on the pattern are the sleeves and the odd numbers are the contrast. 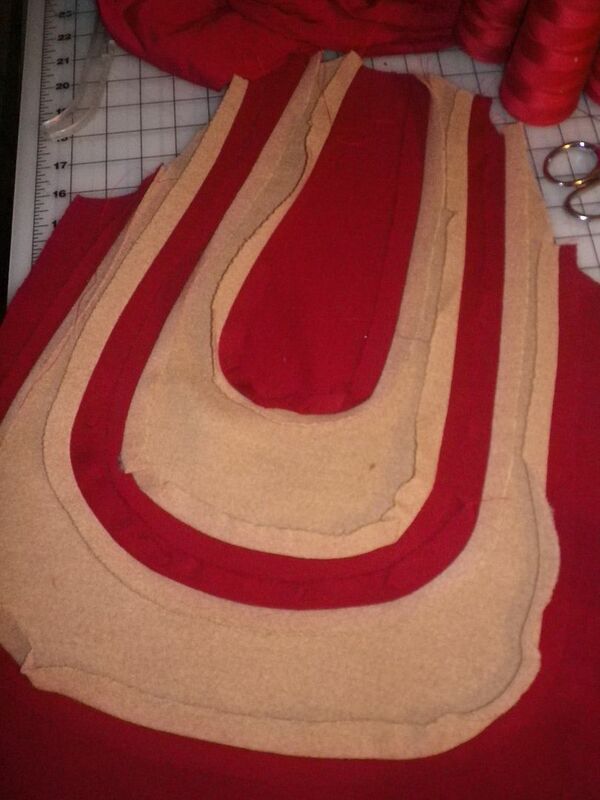 To do the piecing, I just pinned them all together prior to sewing. Hand basting would have been better, but I am lazy. Argh. This is my one slow down. I wanted to serge the entire dress. 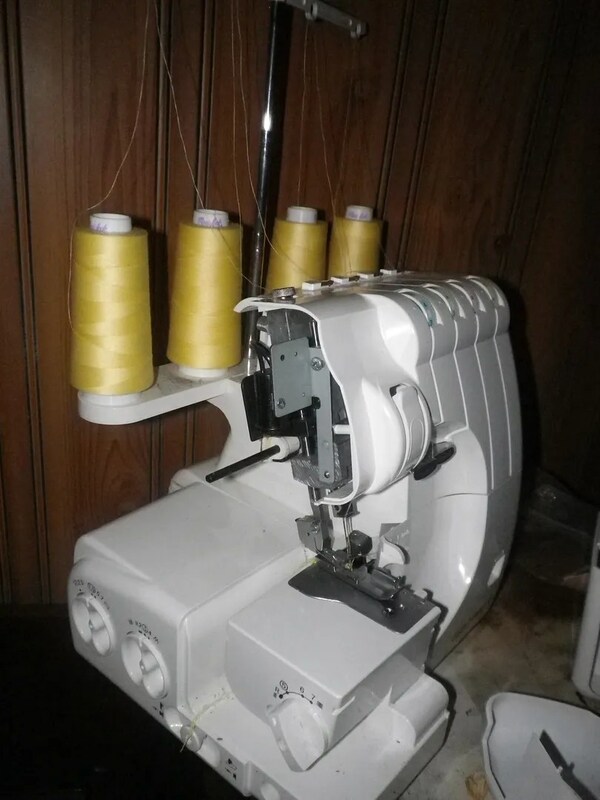 But, when I sat down to sew, I was reminded that the bulb on my Euro Pro serger is blown. It’s the first time it’s needed replacing in about ten years. The machine has to be disassembled to replace the bulb and the bulb I had on hand a few weeks ago when I sat down to do this was too big. I never put the machine back together. So, I sewed on my sewing machine. I started with a stretch stitch (slight zig zag) but it was SO SLOW. I just threw caution to the wind and sewed with a long straight stitch. The sleeves aren’t going to receive much stress so I’m not worried about the stitches popping. No photo of this, but I used bias knit interfacing along the hem, neck edge, sleeve edges and shoulder seams. The fabric is fairly stable, but doing this for knits has become habit for me. I could have just about finished this dress last night. But, I’m hoping to replace the 15w serger bulb today. That will allow me to finish all the raw edges (above). Hopefully, the next post will be the finished dress! 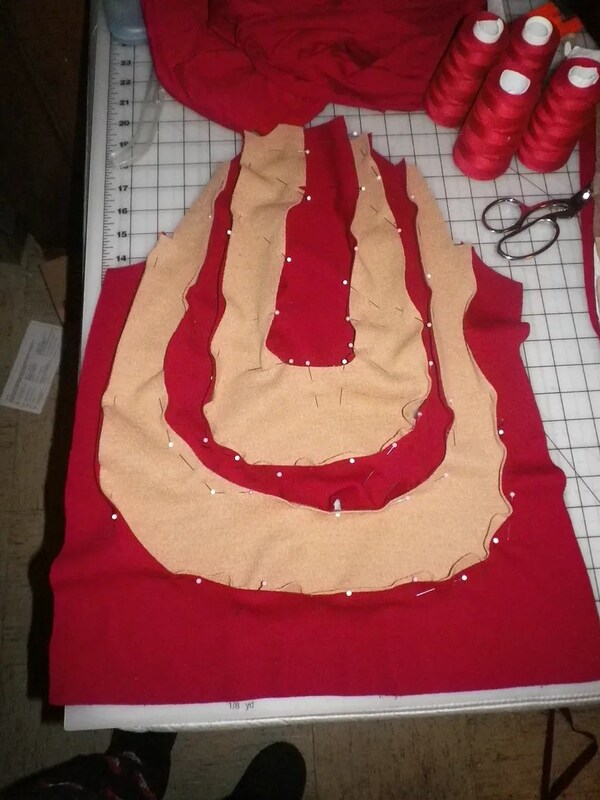 I like how your dress is taking shape. That’s a good question. I’m not huge on finishing knits if I didn’t sew them on a serger. This fabric (the wool in paticular) is slightly ravely. I think in a wash or two, it would nat up and not unravel. But, I also want to finish this nicely inside with the serger so it looks just as nice inside. The curved insets on those sleeves are fabulous! And I love the color combination you chose. Can’t wait to see the finished product! I have this pattern, want to sew it up, but have been dragging my feet. Your dress just might give me the incentive I need to “get to it”. Love your color combo. I can’t wait to see your finished dress — I keep eyeballing the pattern in the store but I’ve been hesitant to buy it because I’m afraid it’ll make me look like “Manos: Hands of Fate.” Seeing it succesfully completed may just convince me to give it a try. Absolutely great – i’m inspired to go upstairs and start sewing! Question: do you hand sew in the ends from the serged threads? On a sewing machine you backstitch at the beginning and end of a seam – so what do I do with my serged seams? For this, the end will get caught up in the shoulder seams / armscye. I will probably not serge them after I put the sleeves in. Oooh, I can’t wait to see your dress. I kind of have always wanted to make this dress, but was too wussy to try. Doesn’t the edge of jersey roll up? The knits I gravitate to are fairly stable and don’t roll. The last knit I used that rolled was a supplex knit for exercise gear and those I finished on a friends coverstitch machine. I have this pattern but have stayed away from it because of the sleeves, the way you have yours pinned out make it all seem so simple, I might have to revisit this sooner rather than later. Out of curiosity, what shoes will you wear with it? Those sleeves are looking amazing, I can see this dress being very you so can’t wait to see the finished article! I’m looking forward to seeing this on you. The first time I saw this, I loved it and I’ve never had the courage to make it. I’ve read about the sizing issues and I didn’t think I wanted to be disappointed, so I’ve never attempted it. I still love it and I think it’s going to look great on you. I just finished it tonight and it’s not tentlike at all on me! Seriously. I could have made a bigger FBA. But, other than that it looks awesome! Argh! I SO want to make this dress soon. Too much to sew, too little time. Very cool color choices. Can’t wait to see the finished product! Thank you so much for making another blog post. I’ve missed them. Can’t wait to see the finished dress.